CyberLink Corp.(5203.TW), announced a new nonpartisan initiative to get workers out of the office to vote in the midterm elections this Nov. 6. Sending out a call to action to employers and workers around the country, CyberLink is encouraging bosses to let their employees work from home on election day to make the voting process easier. 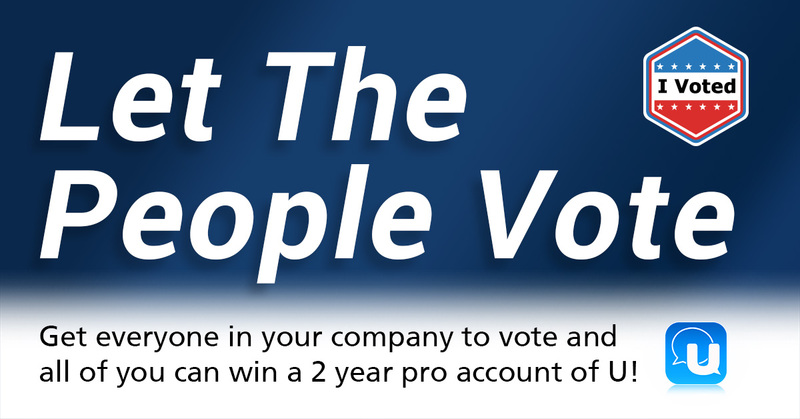 To boost participation, CyberLink is offering a free 2-year PRO account for their unified communication tool, U, to the company who has the most employees vote this year. To enter to win the PRO account, employees must tag their own company and CyberLink U in a post on Instagram (@cyberlinkofficial) with the hashtag #IvoteUwin, proving that they voted by showing their absentee ballot mailed in or their “I Voted” sticker on election day. With the average commute time in the US being close to 30 minutes and no federal law that requires employers to give their employees time off to go to the polls, work can be a major interference in Americans casting their vote. Allowing employees to work from home on election day is a major factor in getting more people to participate in the democratic process, and CyberLink’s U is the perfect way to stay in touch with colleagues or bosses while working remote. Replacing outdated web conferencing systems, U provides a simple and easy-to-use solution for virtual meetings, webinars and group messaging wherever you are and on any device. Its three main features include U Messenger, U Meeting and U Webinar. The platform offers a forum for easy team collaboration with drag-and-drop file sharing, high-definition browser-based video meetings for up to 100 participants and webinars with screen sharing, PowerPoint integration, live annotations and more. CyberLink’s U, in addition to serving as a complete solution for remote workers, is the most intuitive and robust unified communication tool for any office providing the instruments to increase productivity and office communication. U provides different subscription plans tailored to particular business requirements. For meetings and webinars, plans are available according to the number of participants and session duration needed. A free version of U offers meetings and webinars for up to 25 participants for a maximum of 50 minutes and 60 minutes respectively.